Hobie Forums • View topic - Sail for fishing? stupid or not? Sail for fishing? stupid or not? Post subject: Sail for fishing? stupid or not? I am considering buying a sail for my Revolution. I am wondering if any of you FISHERPEOPLE use one. Is it easily put out of the way when fishing? Does it get in the way? What's the scoop? Sailing looks like fun but I am a Fisherman that just happens to know how to sail. Is it easily put out of the way when fishing? Does it get in the way? Check out some of the many posts by AlohaDan re fishing while sailing. He is probably our resident expert on open water fishing for large pelagics in DEEP water while sailing. Personally, I am multi-task challenged, and so far have only done one or the other, but not both. 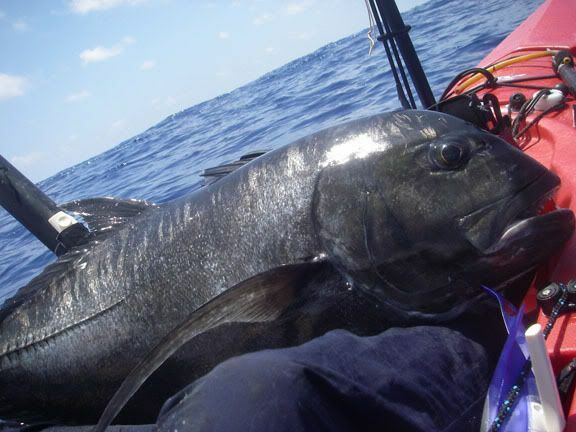 Here is one of Dan's captures, a 25-30 lb black ulua. As usual you have provided the needed information. I have decided not to use a sail for fishing but I may buy one anyway and use it on those windy days when I can not sight fish. I have the sail with my Revo, and its fun, but I think it might get in the way of fishing (havent tried yet). Also the line whipping around is annoying if you let the sails go slack. And with gusts you constantly need to change rudder and shift weight, so might be more tricky than its worth. With the sail tightly furled around the mast it will fit in the paddle holder. That's where I store mine on our Tandem and Adventure. The bearings make it easier to furl but it will work with just the knuckle and a line. Use the sail to troll. When you hookup use stringy's rig to furl it in a NY second. Then depending on size of fish fight it with mast up. Or take it down and stash it. Have done this not only with ulua, but 49 lb ahi.